Two months ago I introduced 52 Weeks of Health with Week One – Power up with Powerful Vegetables. How are you doing with that one? Are you able to work leafy greens into your daily meal plan? Well, this week’s step should help you out and increase your intake of other vegetables at the same time. The more you partake of a wide variety of vegetables, the healthier you will be because you will have supplied your body with more of the vitamins, anti-oxidants, and phytochemicals it needs to be at its cancer-fighting, healthy-heart-making, virus-stomping best. The United States government encourages us to eat 5 servings of fruits and vegetables a day. In reality I think even they would agree that it should be more than that. After all the research I have done I have come to the conclusion that we should be striving for a minimum of 5 – 6 servings of vegetables per day with a couple of servings of fruit added to them. When we make vegetables, high-quality proteins, and healthy fats a priority we find we naturally decrease our intake of highly processed carbohydrates because our bodies are so satisfied with the nutrients we are feeding them. So, this week I would like to challenge all of us to include at least one salad in our meal plans. Lunch, dinner, or mid-afternoon snack. It doesn’t matter when; just do it. But also make a commitment to expand your repertoire of salads. If you serve the same old garden salad with ranch dressing every night you and your family will get tired of it quickly and you won’t be getting the variety you need. So make a trip to the grocery store and stock up on different flavors of oils (olive, walnut, avocado are great starts) and vinegars and learn to make some delicious salad dressings that will have your family clamoring for more. If making your own salad dressing seems too overwhelming now, then go ahead and buy some ready-made dressings. The important thing this week is that you get that salad a day. To start you off, here is the salad I had for lunch today. Now I don’t have quantities for the salad part; I had to force myself to measure for the dressing. I’m a little of this, little of that type of cook so rarely does anything come out the same way twice. My children were treated to “pantry surprises” all of their lives; just ask them about it. Oh right, most of you don’t know them – but you can meet one of my daughters; she’s the blogger of Three Times the Giggles. Take a trip to her blog and meet her. 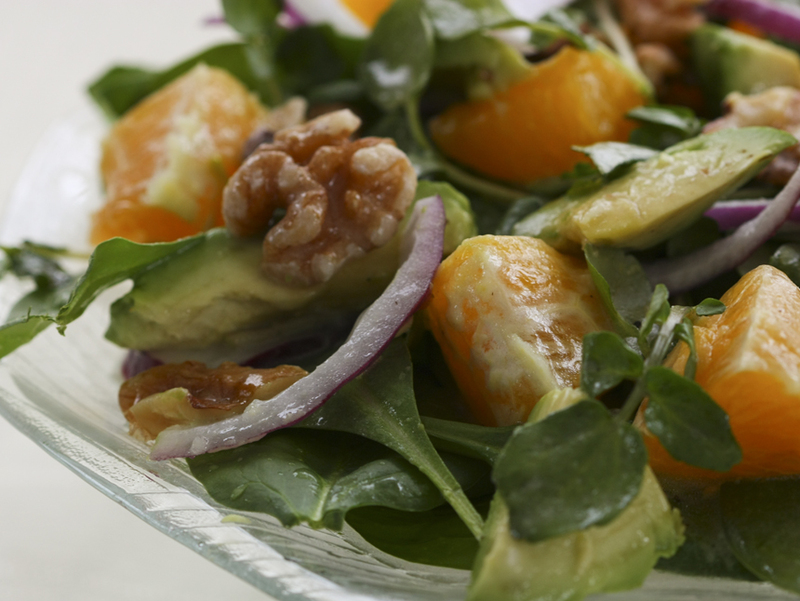 This salad will provide you with plenty of beta-carotene, vitamin C, vitamin E, omega-3 fatty acids (from the walnuts and walnut oils) and some healthy mono-saturated fats from the avocado along with many phytonutrients. Your body will thank you. I’m enjoying your blog. Thank you for your willingness to help us learn to take better care of the miraculous machines we’ve been given to manage. (our bodies) Keep up the good work!